Within Teamwork Projects you can share files that have been uploaded to your project. Note: To share files you must first enable it within the site settings. Click your profile icon in the top right corner of your site, and select Settings from the dropdown menu. 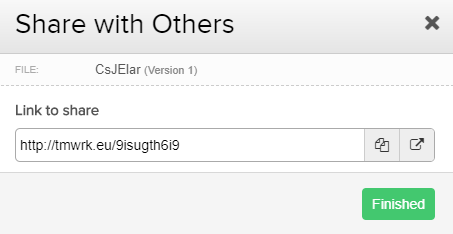 In the General tab of the Settings area, you will see an option for Can Share Files? that you can toggle on to enable. Once file sharing is enabled, go to the Files area of your project. Click the options down arrow to the right of the file you want to share, and select Share from the dropdown menu. 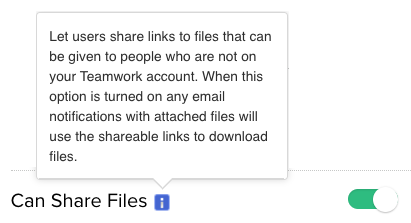 In the share modal, you can highlight and copy the shareable link, or use the copy to clipboard button to the right of the link. You will also have the option on the far right to open the link.